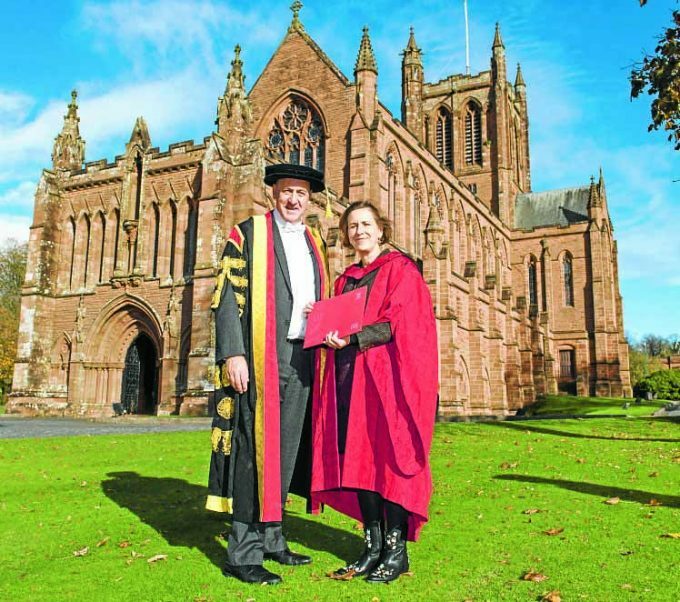 EXPERIENCED television journalist Kirsty Wark received an honorary doctorate from the University of the West of Scotland (UWS) at its graduation ceremony at the Crichton Church in Dumfries yesterday. Kirsty, who was born in the town, has presented a range of television programmes over the past 30 years, including the groundbreaking Late Show and election night specials, and has fronted the BBC’s flagship current affairs show, Newsnight, since 1993. In addition to political reporting, Kirsty hosted The Review Show, the weekly arts and culture programme, for over a decade. Career highlights have included high profile interviews with Margaret Thatcher, Madonna, Damien Hurst and George Clooney – to name but a few – while her accolades include BAFTA Awards for Best Television Presenter, Journalist of the Year and Outstanding Contribution to Broadcasting. Kirsty said: “I feel very privileged to receive this honorary doctorate from an institution which offers so much to local students. She is pictured alongside UWS principal and vice-chancellor Professor Craig Mahoney, who said: “We are so pleased to have presented Kirsty with an honorary doctorate at our Dumfries campus. “She really is a leading light for our students, particularly for those looking to enter the world of media.